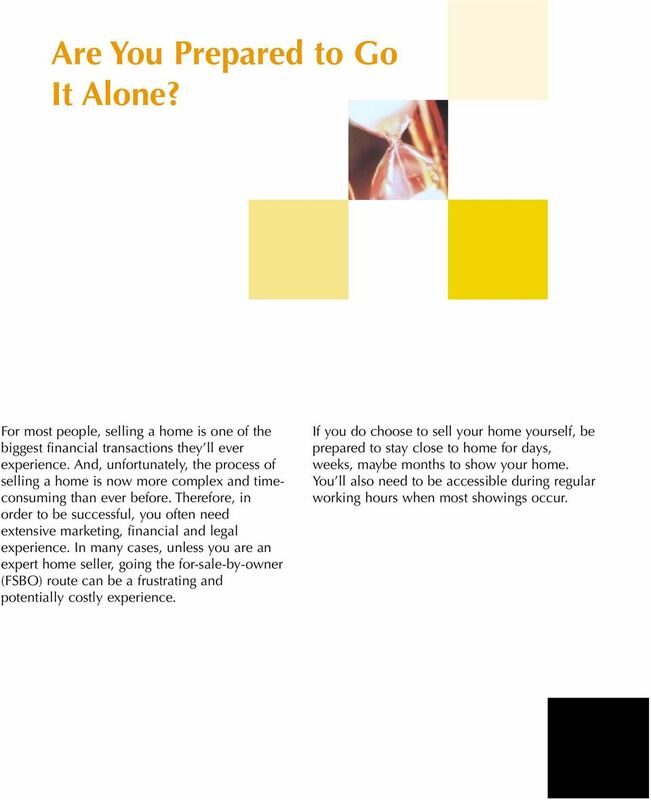 Download "Thinking About Selling Your Home on Your Own? 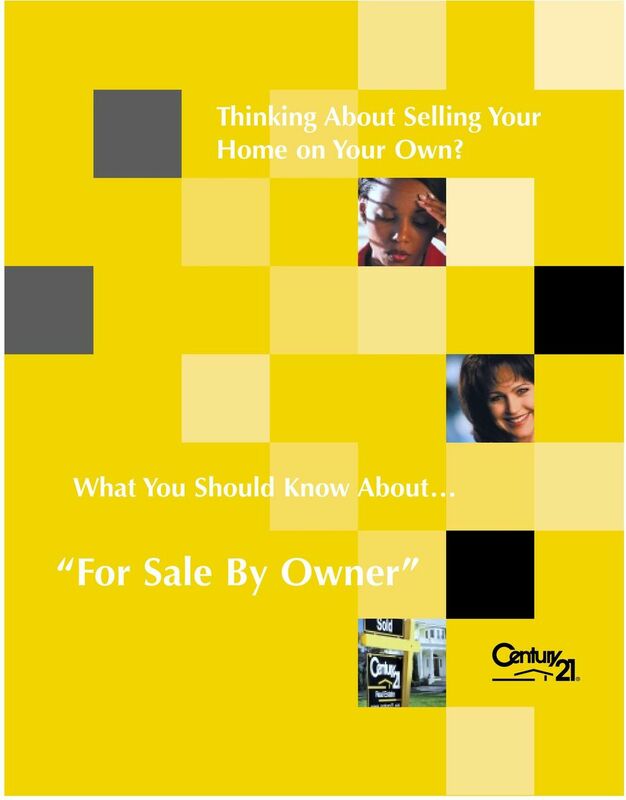 What You Should Know About... For Sale By Owner"
2 Are You Prepared to Go It Alone? For most people, selling a home is one of the biggest financial transactions they ll ever experience. And, unfortunately, the process of selling a home is now more complex and timeconsuming than ever before. Therefore, in order to be successful, you often need extensive marketing, financial and legal experience. In many cases, unless you are an expert home seller, going the for-sale-by-owner (FSBO) route can be a frustrating and potentially costly experience. If you do choose to sell your home yourself, be prepared to stay close to home for days, weeks, maybe months to show your home. You ll also need to be accessible during regular working hours when most showings occur. 3 Leave Your Worries Behind with the CENTURY 21 System You already lead a hectic life. Why not let the CENTURY 21 System, the residential real estate sales organization consumers think of first*, work for you and save you time, frustration, and money? 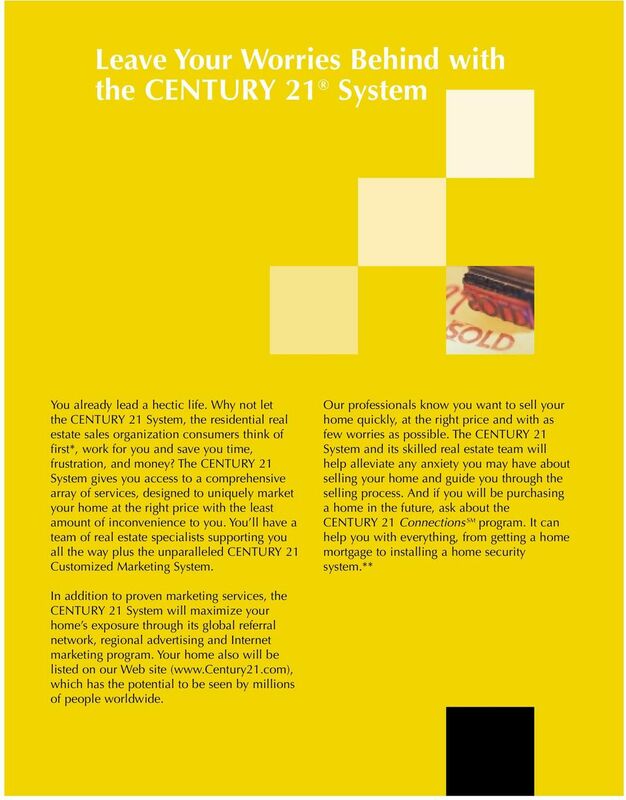 The CENTURY 21 System gives you access to a comprehensive array of services, designed to uniquely market your home at the right price with the least amount of inconvenience to you. You ll have a team of real estate specialists supporting you all the way plus the unparalleled CENTURY 21 Customized Marketing System. Our professionals know you want to sell your home quickly, at the right price and with as few worries as possible. The CENTURY 21 System and its skilled real estate team will help alleviate any anxiety you may have about selling your home and guide you through the selling process. And if you will be purchasing a home in the future, ask about the CENTURY 21 Connections SM program. It can help you with everything, from getting a home mortgage to installing a home security system. 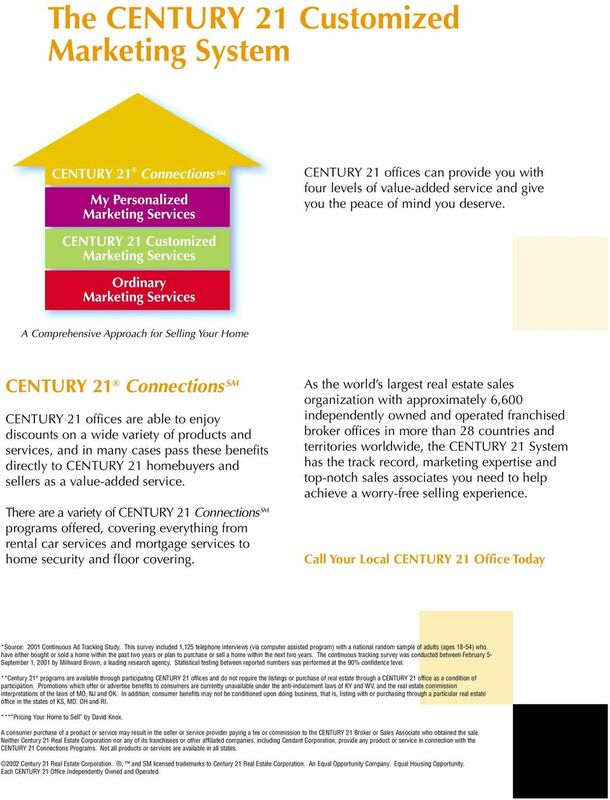 ** In addition to proven marketing services, the CENTURY 21 System will maximize your home s exposure through its global referral network, regional advertising and Internet marketing program. Your home also will be listed on our Web site ( which has the potential to be seen by millions of people worldwide. 5 3 5 To Maximize Your Property s Exposure in the Marketplace In most markets, finding qualified buyers will require more than the standard yard sign, classified ad and open house. In fact, according to The National Association of Realtors, 82% of real estate sales are the result of agent contacts through previous clients, referrals, friends, family and personal contacts. Since many sales involve out-of-town buyers, marketing a home requires exclusive connections and a strategic marketing plan. At the very least, you should have your home listed in the multiple listing service (MLS), which is only open to licensed real estate agents. CENTURY 21 home sales specialists have access to state-of-the-art technology tools to share referrals across a global network. Plus, Your CENTURY 21 agent will spend time behind the scenes helping you target serious buyers and make the best of your prime selling period. 4 Buyers Are More Comfortable Contacting Agents Buyers may be leery of contacting or intruding upon home owners with whom they are unfamiliar. Potential buyers might also be intimidated looking through a home if the owner is present and feel uncomfortable making an offer if they know they ll be negotiating directly with the owner. They often appreciate the accessibility and objectivity of a respected CENTURY 21 real estate professional. To Pre-screen Prospective Buyers Cleaning your home each time someone wants to look at it is a lot of work. To save you time and unnecessary traffic through your home, your CENTURY 21 agent can help pre-screen buyers to ensure they really are motivated to buy and are financially prepared to do so. And for your safety, all showings will be scheduled through your agent s office. 6 To Help Guard Against Misrepresentation And Claims In today s litigious society it becomes imperative that all matters relating to the sale of the property, i.e. physical conditions, history, zoning, etc., be accurately and comprehensively disclosed. Overlooking even one form or required disclosure may lead to an expensive claim. The knowledge and experience of a CENTURY 21 real estate professional can often help provide assistance with these issues. 7 To Provide Buyers with Community Information Today s buyer seeks to make informed decisions and demands a significantly high level of information related to their purchase. Your CENTURY 21 agent can provide them with detailed information on your community, schools, local government and much more. 8 To Ensure Privacy, Confidentiality and Safety for Both Sellers and Buyers These days, you don t want just anyone knocking your door and touring your home. The best way to help keep you and your family safe is to have a CENTURY 21 professional at your side, accompanying buyers as they tour your home and handling sometimes stressful negotiations. 6 9 To Negotiate for Top Dollar Reaching an agreement between seller and buyer and then closing the deal requires complete objectivity and a thorough understanding of deeds, abstracts, offers, contingencies, disclosures, title searches, etc. Working with a skilled negotiator such as your CENTURY 21 sales professional with your best interests in mind may improve your chances of selling at the price that brings you peace of mind. 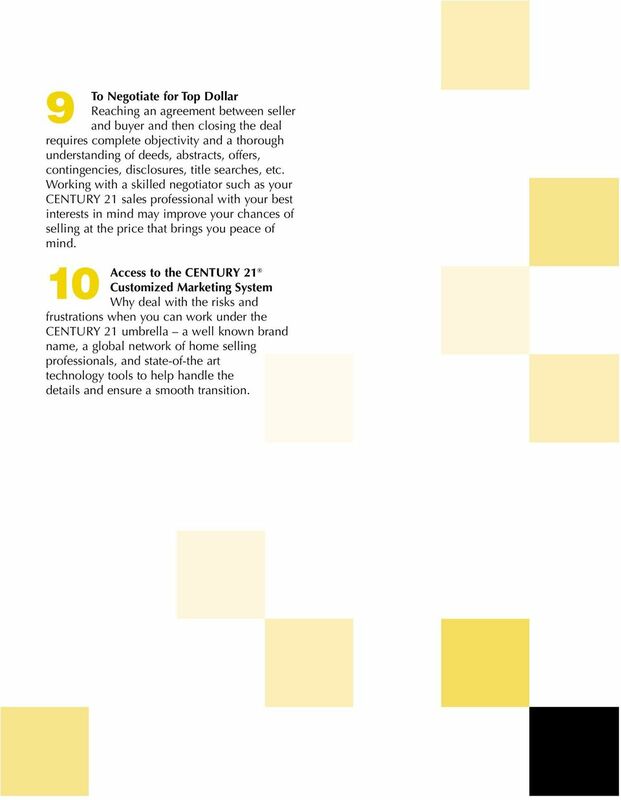 10 Access to the CENTURY 21 Customized Marketing System Why deal with the risks and frustrations when you can work under the CENTURY 21 umbrella a well known brand name, a global network of home selling professionals, and state-of-the art technology tools to help handle the details and ensure a smooth transition. 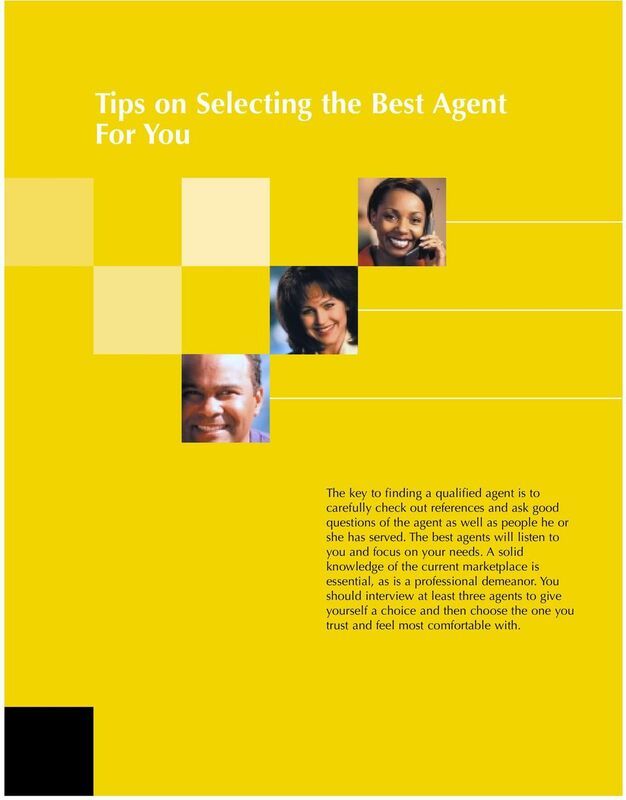 7 Tips on Selecting the Best Agent For You The key to finding a qualified agent is to carefully check out references and ask good questions of the agent as well as people he or she has served. The best agents will listen to you and focus on your needs. A solid knowledge of the current marketplace is essential, as is a professional demeanor. You should interview at least three agents to give yourself a choice and then choose the one you trust and feel most comfortable with. 8 Here are some questions you might want to ask: How long have you lived in or served the area? How long have you been selling real estate? What professional designations do you have? How accessible are you? Do you have voice mail, , a pager, cell phone? Why are you personally motivated to sell my house? How will you keep me updated through the entire listing and closing process? 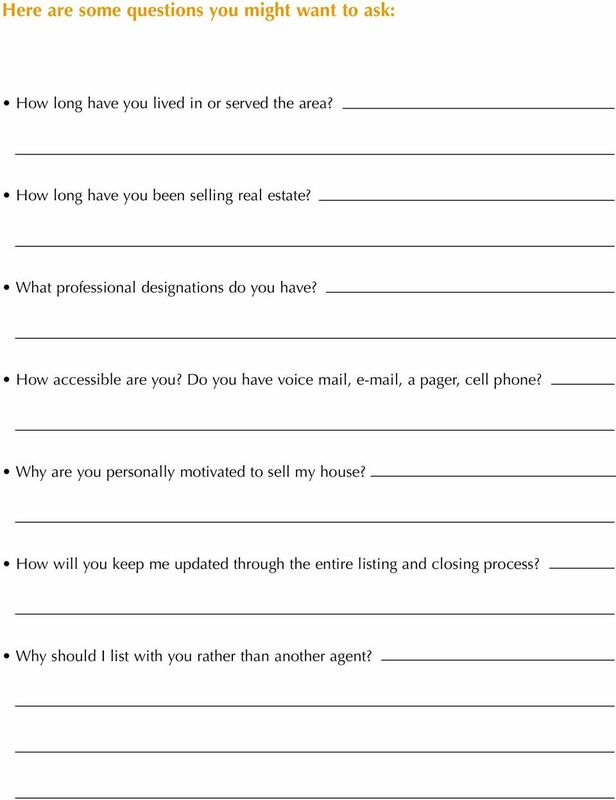 Why should I list with you rather than another agent? 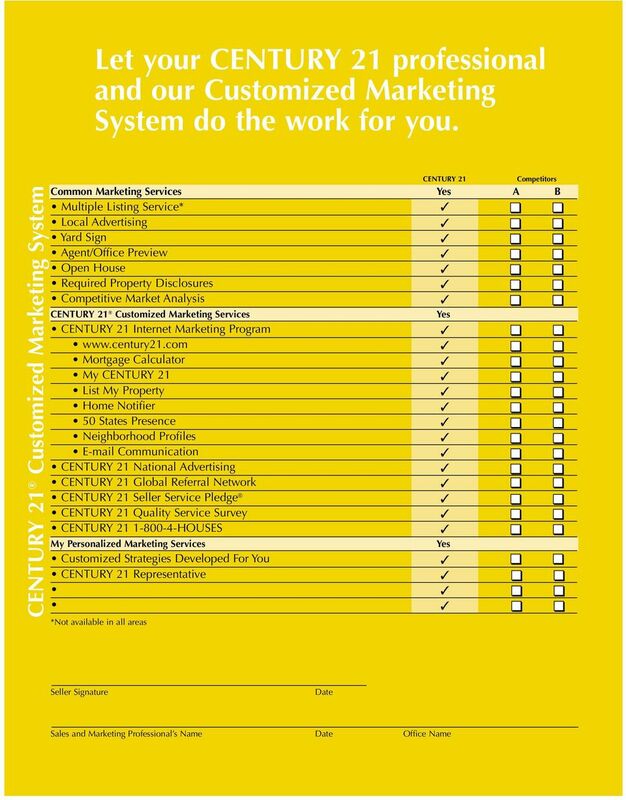 10 The CENTURY 21 Customized Marketing System CENTURY 21 offices can provide you with four levels of value-added service and give you the peace of mind you deserve. 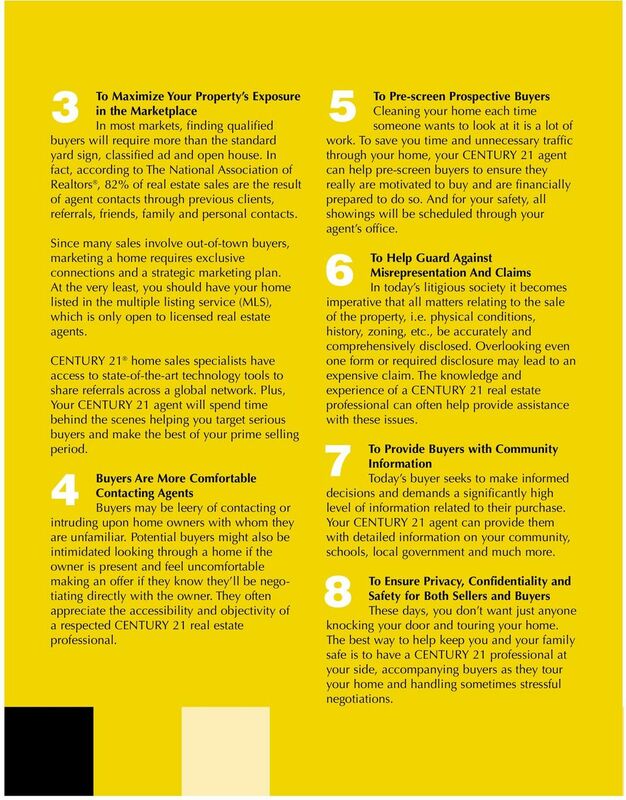 A Comprehensive Approach for Selling Your Home CENTURY 21 Connections SM CENTURY 21 offices are able to enjoy discounts on a wide variety of products and services, and in many cases pass these benefits directly to CENTURY 21 homebuyers and sellers as a value-added service. There are a variety of CENTURY 21 Connections SM programs offered, covering everything from rental car services and mortgage services to home security and floor covering. As the world s largest real estate sales organization with approximately 6,600 independently owned and operated franchised broker offices in more than 28 countries and territories worldwide, the CENTURY 21 System has the track record, marketing expertise and top-notch sales associates you need to help achieve a worry-free selling experience. Call Your Local CENTURY 21 Office Today *Source: 2001 Continuous Ad Tracking Study. This survey included 1,125 telephone interviews (via computer assisted program) with a national random sample of adults (ages 18-54) who have either bought or sold a home within the past two years or plan to purchase or sell a home within the next two years. The continuous tracking survey was conducted between February 5- September 1, 2001 by Millward Brown, a leading research agency. Statistical testing between reported numbers was performed at the 90% confidence level. **Century 21 programs are available through participating CENTURY 21 offices and do not require the listings or purchase of real estate through a CENTURY 21 office as a condition of participation. Promotions which offer or advertise benefits to consumers are currently unavailable under the anti-inducement laws of KY and WV, and the real estate commission interpretations of the laws of MO, NJ and OK. In addition, consumer benefits may not be conditioned upon doing business, that is, listing with or purchasing through a particular real estate office in the states of KS, MD. OH and RI. 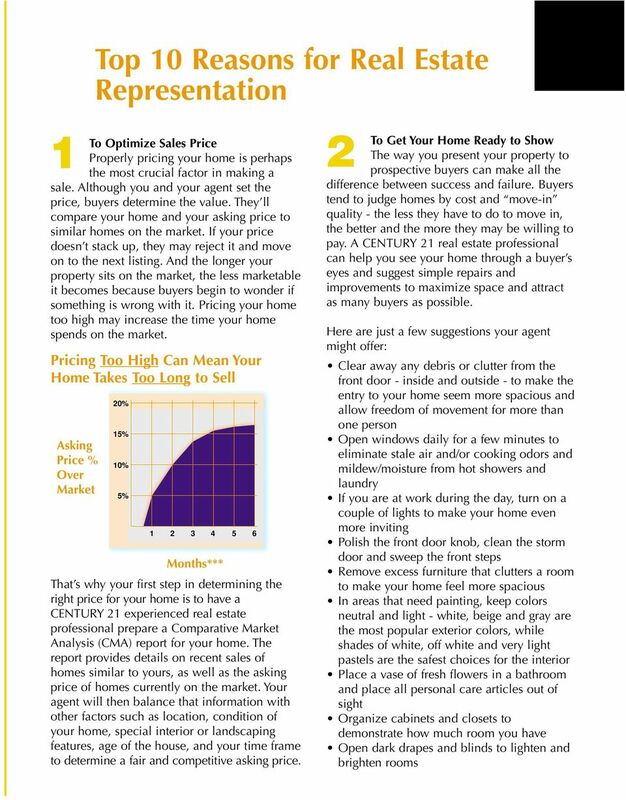 *** Pricing Your Home to Sell by David Knox. A consumer purchase of a product or service may result in the seller or service provider paying a fee or commission to the CENTURY 21 Broker or Sales Associate who obtained the sale. Neither Century 21 Real Estate Corporation nor any of its franchisees or other affiliated companies, including Cendant Corporation, provide any product or service in connection with the CENTURY 21 Connections Programs. Not all products or services are available in all states Century 21 Real Estate Corporation., and SM licensed trademarks to Century 21 Real Estate Corporation. An Equal Opportunity Company. Equal Housing Opportunity. Each CENTURY 21 Office Independently Owned and Operated.